Baker, R., Blumberg, S. J., Brick, J. M., Couper, M. P., Courtright, M., Dennis, J. M., Dillman, D., Frankel, M. R., Garland, P., Groves, R. M., Kennedy, C., Krosnick, J., Lavrakas, P. J., Lee, S., Link, M., Piekarski, L., Rao, K., Thomas, R. K., & Zahs, D. (2010). Research synthesis AAPOR report on online panels. Public Opinion Quarterly, 74, 711–781. Berinsky, A. J., Huber, G. A., & Lenz, G. S. (2012). Evaluating online labor markets for experimental research: Amazon.com’s Mechanical Turk. Political Analysis, 20, 351–368. Berinsky, A. J., Margolis, M. F., & Sances, M. W. (2014). Separating the shirkers from the workers? Making sure respondents pay attention on self-administered surveys. American Journal of Political Science, 58, 739–753. Cacioppo, J. T., Petty, R. E., Feinstein, J. A., & Jarvis, W. B. G. (1996). Dispositional differences in cognitive motivation: The life and times of individuals varying in need for cognition. Psychological Bulletin, 119, 197–253. Chandler, J., Mueller, P., & Paolacci, G. (2014). Nonnaïveté among Amazon Mechanical Turk workers: Consequences and solutions for behavioral researchers. Behavior Research Methods, 46, 112–130. Chang, L. & Krosnick, J. A. (2009). National surveys via RDD telephone interviewing versus the internet comparing sample representativeness and response quality. Public Opinion Quarterly, 73, 641–678. Couper, M. P., Tourangeau, R., Conrad, F. G., & Zhang, C. (2013). The design of grids in Web surveys. Social Science Computer Review, 31, 322–345. Fricker, S., Galesic, M., Tourangeau, R., & Yan, T. (2005). An experimental comparison of web and telephone surveys. Public Opinion Quarterly, 69, 370–392. Goodman, J. K., Cryder, C. E., & Cheema, A. (2013). Data collection in a flat world: The strengths and weaknesses of Mechanical Turk samples. Journal of Behavioral Decision Making, 26, 213–224. Gosling, S. D., Vazire, S., Srivastava, S., & John, O. P. (2004). Should we trust web-based studies? A comparative analysis of six preconceptions about internet questionnaires. The American Psychologist, 59, 93–104. Jackman, S. (2005). Pooling the polls over an election campaign. Australian Journal of Political Science, 40, 499–517. Kobayashi, T. & Hoshino, T. (2011). 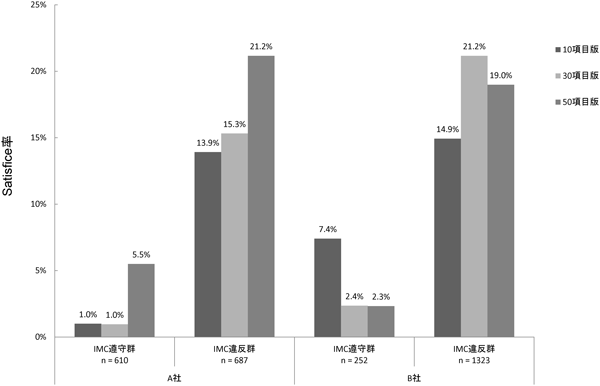 Propensity score adjustment for internet surveys of voting behavior: A case in Japan. 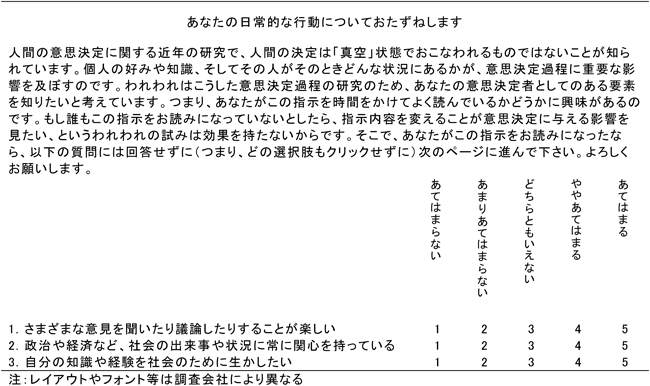 Japanese Journal of Electoral Studies, 27, 104–117. Krosnick, J. A. (1991). Response strategies for coping with the cognitive demands of attitude measures in surveys. Applied Cognitive Psychology, 5, 213–236. Krosnick, J. A. & Presser, S. (2010). Question and questionnaire design. Handbook of survey research (2nd ed.). Bingley, UK: Emerald Group Publishing Limited. pp. 263–314. 前田忠彦・中谷吉孝・横田有一・中田　清・中島一郎・上嶋幸則・大隅　昇（2007）．Web調査方式による複数パネル間の比較実験　日本行動計量学会大会発表論文抄録集，35, 237–240. Mann, C. B. & Klofstad, C. A. (2015). The role of call quality in voter mobilization: Implications for electoral outcomes and experimental design. Political Behavior, 37, 135–154. Oppenheimer, D. M., Meyvis, T., & Davidenko, N. (2009). Instructional manipulation checks: Detecting satisficing to increase statistical power. Journal of Experimental Social Psychology, 45, 867–872. Rivers, D. (2006). Sample matching: Representative sampling from internet panels. Polimetrix White Paper Series. Sherif, C. W., Sherif, M., & Nebergall, R. E. (1965). Attitude and attitude change: The social judgment-involvement approach. Philadelphia,　PA: Saunders. Sherif, M. & Hovland, C. I. (1961). Social judgment: Assimilation and contrast effects in communication and attitude change. New Haven, CT: Yale University Press. Simon, H. A. (1957). Models of man; social and rational. New York: John Wiley and Sons, Inc.
Smith, T. W. (1978). In search of House effects: A comparison of responses to various questions different survey organizations. Public Opinion Quarterly, 42, 443–463. Tourangeau, R., Conrad, F., & Couper, M. (2013). The science of web surveys. Oxford University Press. Vonk, T. W. E., van Ossenbruggen, R., & Willems, P. (2006). The effects of panel recruitment and management on research results. ESOMAR Panel Research. Yeager, D. S., Krosnick, J. A., Chang, L., Javitz, H. S., Levendusky, M. S., Simpser, A., & Wang, R. (2011). Comparing the accuracy of RDD telephone surveys and internet surveys conducted with probability and non-probability samples. Public Opinion Quarterly, 75, 709–747.